After the jungle, we did the usual things in Cusco - washing clothes that had been damp for 9 days, enjoying hot showers - as far as that is possible with the so-called South American Frankenstein showers (the electrical element is attached to the water pipe and turning on the tap gives you a mild shock), and visiting some of the numerous Inca ruins. 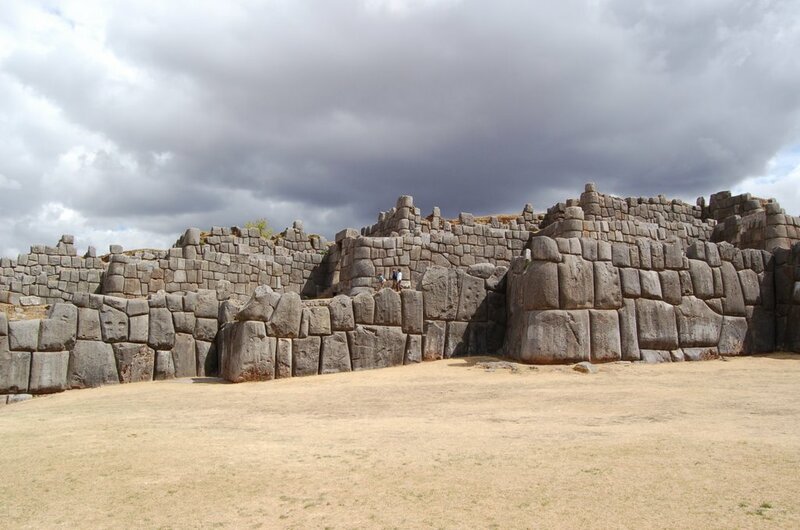 Just north of Cusco is the Inca fortress of Sacsayhuaman. 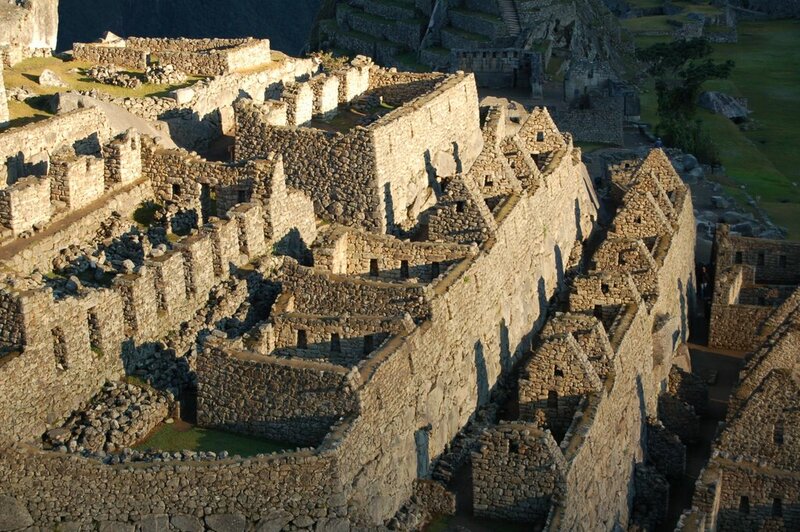 Protected on three sides by steep cliffs, the Incas built a three tiered set of ramparts to protect the fourth side. Composed of rocks, some of which have been dragged 30 kilometres to the site and the heaviest of which weighs 300 tonnes, the ramparts stretch 600 metres and remain largely intact even today. The stonework took 100 years to complete (approximately the period of the Inca´s huge South American empire) and is mortarless - the stones carved so well that they simply fit together with no gaps. 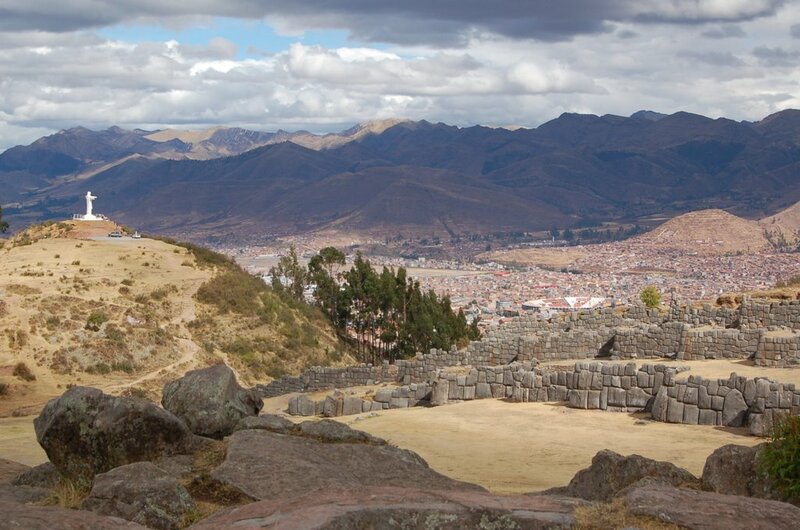 However, despite the Incas´ efforts, the Spanish conquistadors stormed the fortress and slaughtered the Incas. Weakened by civil war and a small pox plague that had killed a third of the native population, the Incas stood no chance against the steel blades and cavalry of the Spaniards. 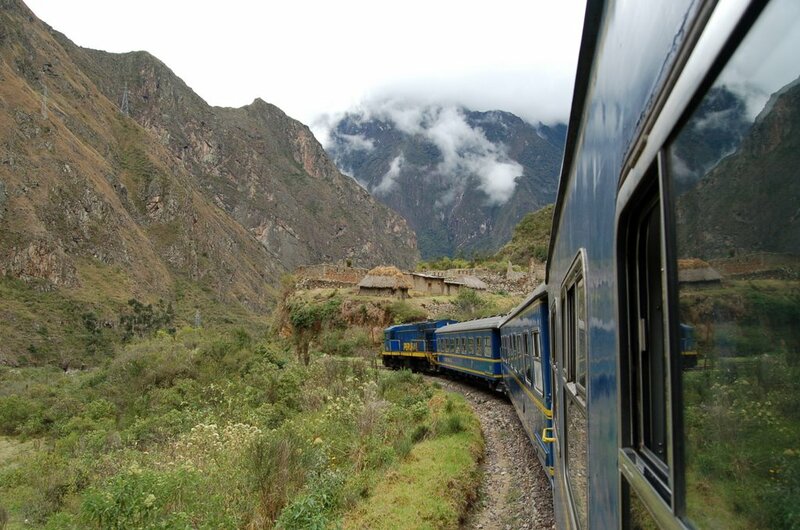 We took the train from Cusco at 6am (in the backpacker class) and to our surprise it rattled uphill through the suburbs, gaining height by simply driving into a dead end, reversing direction and taking another piece of track. In such a manner, we zig-zagged our way out of Cusco and onto an agricultural plain populated by cattle, children on bikes and solitary women watching dirty flocks of sheep. The train, full of white faces, passed through towns - literally down the main street with nothing more than liberal use of the air horn to avoid collisions - and eventually into an ever-narrowing valley. We sat, glued to the window, as the valley closed in, the mountains steepened and the vegetation took control. Hidden somewhere in this had been Machu Picchu, until its "scientific discovery" by Hiram Bingham, an American, and its subsequent development into the most famous tourist site in Peru. We arrived at Aguas Calientes, the Wild West town that acts as a transport hub for the site, and dumped our kit in a hostel before walking the train track out of town to a small flight of steps that disappeared into the jungle. 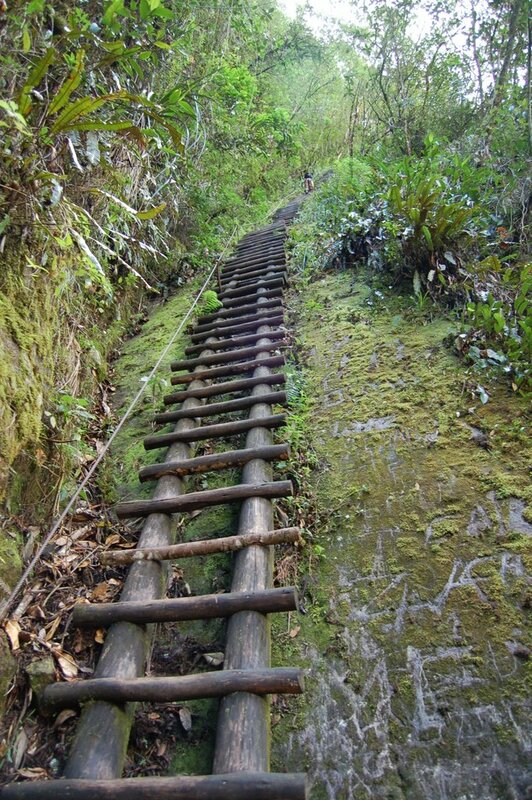 Hopefully, this trail would lead us to the summit of the sacred mountain of Putukusi. For the first half hour, we climbed 100 metre ladders bolted to cliff faces - not an Inca design, but certainly effective in gaining height. The ladders led to a col and then a series of steps (half an hour’s worth of a non-stop Step class) brought us to the summit and a stunning view across the valley of Machu Picchu clinging to a small ridge, snow-capped mountains in the background. We sat for a long time contemplating the site before descending in heavy drops of rain to the town and a rather tepid bath in the sulphury, brown hot springs. 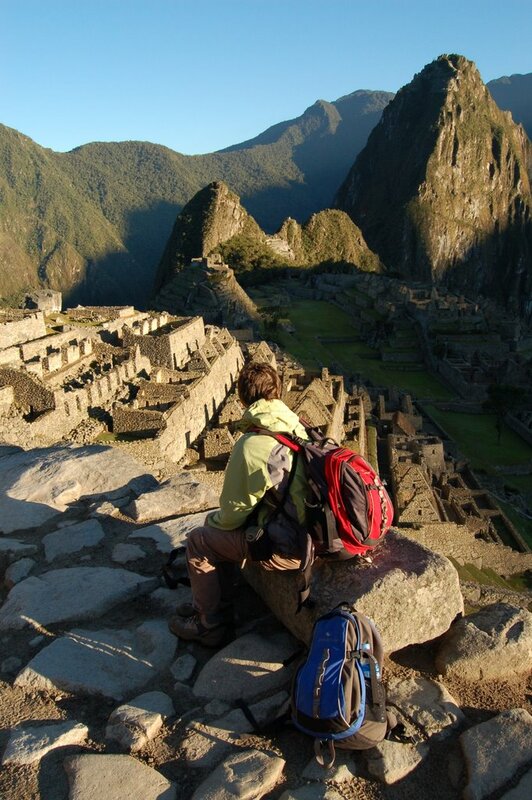 At dawn the next day, we were sat on the agricultural terraces of Machu Picchu watching sun rise over the site. It is difficult to describe the inexorable movement of the sun as it worked its way over the ruins, deep shadows being cast, a warm orange glow on the stonework. It was worth the effort of visiting for the sunrise alone, but we then walked through the walls, temples and chambers alone for twenty minutes before setting off on the trail to the top of Waynupicchu, the unmistakeable pyramid-shaped peak overlooking the site. Steep and unrelenting, we passed a group of complaining Northerners, some wise-cracking, but knackered Canadian and a couple of Americans to reach the summit. Far below, we could see the plaza of Machu Picchu, overrun with tourists regretting their lie in, and the river which curves in a U shape around the ridge on which Machu Picchu sits. We headed down from the summit to the Temple of the Moon - the Inca place of worship for the part of their world that was underground - and imagined the scenes that had taken place in the cave under the huge overhanging rock with carved stone throne at its entrance. Three hours’ walking led back to the main site and we inspected some of the ruins in more detail before taking the bus back to Aguas Calientes and the 4pm train back to Cusco. We had had mixed feelings about visiting Machu Picchu - the blatant commercialisation and touristification making us uncomfortable about joining the masses - but it was worth it many times over. It was an incredible piece of architecture set in the most amazing steep and remote location with a real feeling of history. Back in Cusco, we packed and headed east to Lake Titicaca and Bolivia. 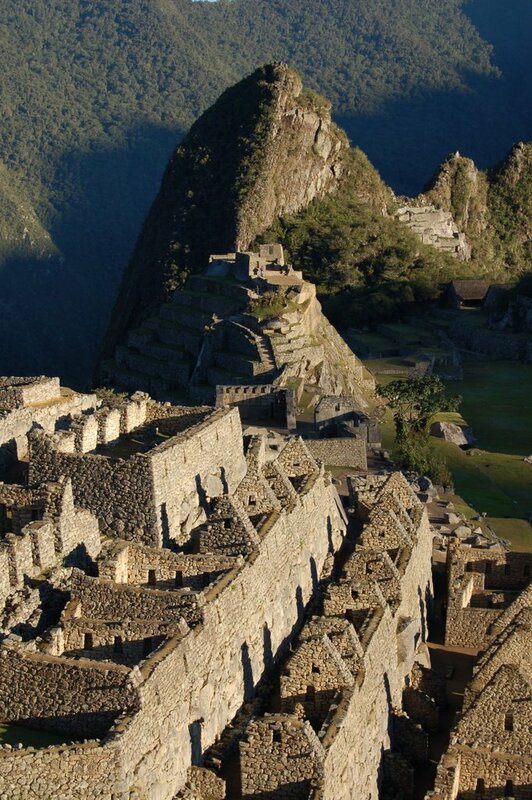 You couldn't escape the Macchu Picchu Experience. I have been told that taking the train to visit the site is not a great experience compare to the 4 days trek.